Who else loves a comforting hamburger meal? Finding an easy and tasteful recipe using hamburger can seem complicating anymore. With so many options, and so many recipes in which require too many ingredients. All us mamas want is something simple sometimes! Stroganoff was always one of my favorite dishes growing up and i was so happy to be handed down this recipe. Many Christmases ago, my aunt Carrie had made all of us women in the family homemade cookbooks with all of our family recipes in them. Even Recipes from before i was a kid! I have so many in there that i want to share with my readers, so i am starting with this one! Not just because its so tasty, but because the ingredients are so simple you could probably make it right now. This recipe is perfect for those nights when you really don’t want to cook, but you know you have to. And you have no idea what to cook. 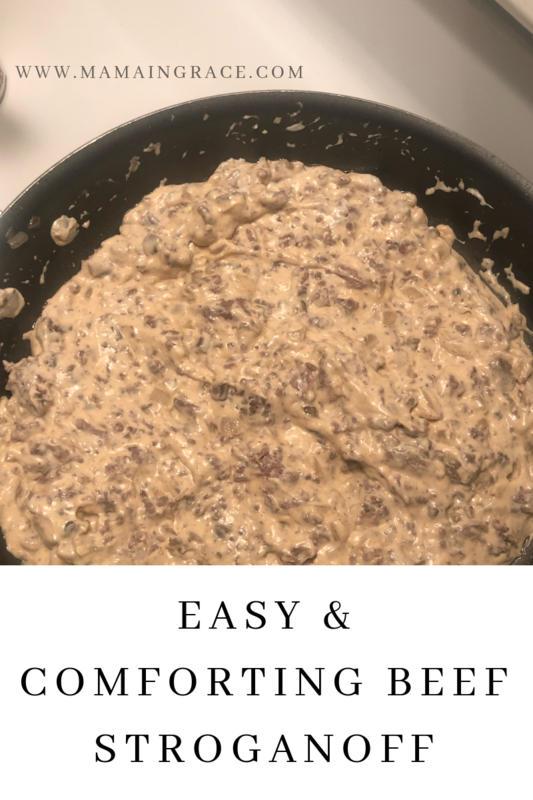 Hamburger Stroganoff is super tasty and liked by all of my kids, thank god! And it takes just about 30 minutes to make including the chopping, browning the meat, and boiling the water for the noodles. Win-Win, Mama! First, you want to start a pot of water to get boiling for your rice or noodles. (especially if your in a time crunch which, lets be honest, most of us parents are) Second, chop your onion and garlic and throw it; (please dont really throw it) in the pan with your hamburger meat. Cook until the meat is brown and then drain the fat. Add remaining 5 ingredients to make the sauce and heat all the way through. Serve over noodles or rice. That’s it!! The easiest hamburger recipe you will ever make, and its packed full of flavor! You wont be disappointed and your family will definitely ask you to make this hamburger recipe again. Trust me! Beats hamburger helper in my opinion- all day, every day, any day! The meal size could easily be doubled for a bigger family who eats more. I know that when my kids get older i will have to double it up! Which will actually be nice so i can use the entire bag of egg noodles! My Tips: Use hamburger, leftover roast, steak, or any kind of meat you desire. This sauce tastes the best with egg noodles in my own opinion. The measurements can also be played with to satisfy your own liking. Sometimes i add a little bit of milk for a creamier sauce. I hope you enjoy this tasty hamburger meal as much as my family and i do! PS- Have you read my recipe for Authentic Carne Asada Street Tacos yet? If you haven’t, you are missing out! Check out the recipe here.